The Athena is a good water ionizer. It performed well for us, has a good warranty and is easy to use. If you're looking for real "bang for your buck" in this price range though, you may want to take a closer look at other models in this price range. 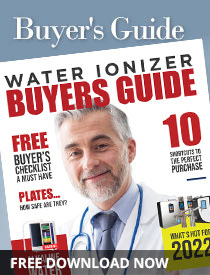 The Jupiter Athena is IonWays top of the line counter top water ionizer. The Athena is a 5-plate water ionizer with dual filtration, good audio/visual alerts, on-board flow control and mineral port operating at a maximum of 80 watts of power. Performance tests on this model were good. We were able to get strong alkaline levels and, depending on the source water, acidic levels below a 3.0 pH. While adjusting power at each of the individual presets is not an option on the Athena, it is possible to adjust the unit's amperage for better performance in stubborn source water areas. The Athena offers users 4 alkaline, 4 acidic and one neutral setting for producing a wide range of alkaline and acidic levels. This is one of the better models when it comes to audio/visual alerts with multiple display panel confirmations of the pH level being produced and a voice alert when you start the unit or when you switch to another level. As with other IonWays models, the Athena lacks a "safe default" setting. This means that the unit will automatically default back to the last setting used - whether that level was safe for drinking or not. If you choose the Athena you'll want to pay attention to the voice and visual alerts at each use. This will ensure that you don't accidentally pour yourself a glass or container full of water at a level that is not suitable for drinking. The dual filtration system features one filter for sediment and particulates and a second bio-stone filter for removing contaminants and preconditioning the water for ionization. The Athena is the only water ionizer from IonWays that features dual filtration. Unfortunately due to recent changes in product configuration the Athena is no longer compatible with the under sink conversion kit though the company is working to address this issue. Just like the Jupter Melody and the Delphi under-counter models, the Athena automatic cleaning uses the DARC cleaning system. This "double automated reverse cleaning" system switches the polarity of the plates every 20 seconds to prevent one set of electrodes from always "attracting" minerals which prevents scale buildup. Though the DARC cleaning system appears to be an intelligent design, we still feel strongly about the use of cleaning cartridges or some cleaning protocol that uses an mild, natural acidic substance to remove scale buildup and flush the system without ionization. You have the option to use the on-board mineral port should you have trouble producing the strongest levels of alkaline ionized water. The port is on the top of the unit and the Athena comes with a sample of calcium if necessary. Additional mineral port calcium inserts are available directly through IonWays or one of their authorized distributors. The Jupiter Athena is backed by IonWays' Limited Lifetime Warranty. The company stands behind this unit 100% for the first five years of ownership. After the first five years IonWays will replace any parts necessary with the customer only paying labor and shipping charges.